Valentus Specialty Chemicals has entered a global technology supply agreement through its Protective Maintenance Coatings business unit and The Thortex Group. US Coatings, a subsidiary of Valentus Specialty Chemicals, will partner with Thortex to provide engineered coatings and repair systems to the worldwide infrastructure repair market. Thortex has been a trusted industry leader for almost three decades using the best technology in protective coatings and rehabilitation systems in the market today. Click here to learn more about Thortex. US Coatings is excited to introduce a new 2K polyurethane finish and surface-tolerant epoxy mastic system that outperforms competing systems in almost every way—at no added cost. Developed by Valentus Specialty Chemicals, the VSC 1200 Topcoat and VSC 1100 Primer are more durable, sustainable and productive on the job. This improved performance is thanks to the groundbreaking Tetrashield™ protective resin developed by Eastman Chemical Company. VSC 1200 Topcoat and VSC 1100 Primer represent the next-generation of heavy-duty industrial maintenance coatings. Owners will like the system’s superior asset protection for the price while contractors will enjoy the ease of use of this system leading to a lower overall cost of ownership for industrial asset owners. The performance-driven marriage of the VSC 1100 primer and the Tetrashield-enhanced VSC 1200 finish is a winning combination in the fight against corrosion with an attractive maintenance price tag. Consistent film build and easier application. Outstanding weathering, including superior gloss and color retention over standard acrylic-polyurethanes. Contractor-friendly with longer pot life and shorter dry time compared to traditional acrylic coating systems. Wide latitude application conditions with long recoat time, fast dry to the touch and faster through cure even at lower temperatures. Environmentally-friendly formula uses high-solids formulation that requires no thinning solvents, thus reducing VOC emissions. Superior adhesion to a wide range of surfaces, including steel, aluminum and concrete. Superior wetting properties to perform even on marginally-prepared surfaces. Accepts a wide variety of weathering or chemical-resistant finishes. With the advanced Tetrashield™ protective resin at its core, VSC 1200 Topcoat provides more flexibility in application while providing superior performance in harsh environments over the long term. The resin responsible for the superior performance has its origins elsewhere in the chemical industry. Before there was Tetrashield™, there was Tritan™—a BPA-free TMCD polyester Eastman developed that offered enhanced clarity, toughness, chemical resistance and impact strength for products used in medical, household and retail applications. Eastman chemists then developed the Tetrashield™ resin to provide in the coatings industry the benefits that Tritan™ offered for consumer products. The result is a heavy-duty industrial maintenance coating that exhibits premium performance without a premium price. Coating projects are shorter, the coating dries faster and critical assets are put back in service sooner—and that keeps costs in check. Find out more about how industrial coating projects can be made easier by reading our guide to a painless painting project. If you want to have a conversation about an upcoming job and whether the VSC 1200 Topcoat / 1100 Primer system is right for your site, let’s talk. One of the important factors a buyer considers during the paint buying process is how well topcoats perform during their service. Also known as weathering finishes, these coatings are designed for ultraviolet (UV) exposure during exterior use. They’re common in any industry that requires equipment or structures to be used or kept outdoors. Topcoats are the first line of defense against the elements, providing protection to intermediate coats which are designed to protect primers. And it’s important to note right away that there’s no such thing as a coating that doesn’t weather. All coatings fade and break down eventually. With a greater understanding of topcoat formulations and quality testing methods, you’re empowered to make the choice that offers the best protection for your critical assets. 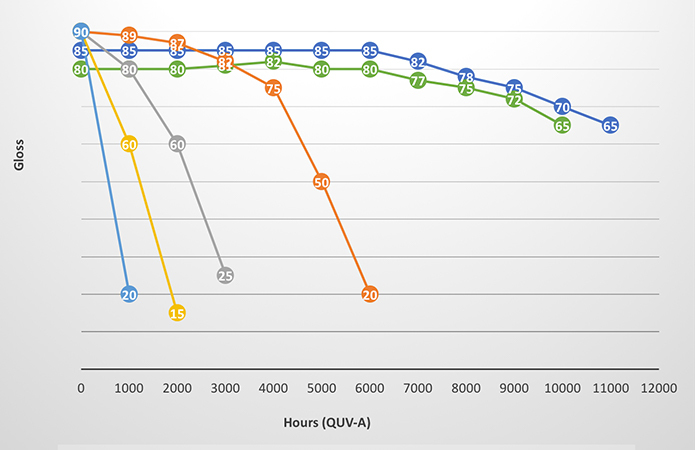 In these tests, UV and moisture exposure is simulated in controlled settings over abbreviated time frames to judge how well coatings stand up to the elements. This is a preferred method for testing and comparing weathering finishes because it’s impractical to rely on real-time field tests that would take years to complete. The UV lamps used to simulate sunlight in these tests emit radiation only in a very narrow bandwidth compared to the broad-spectrum UV radiation produced by the sun. Proper testing in controlled conditions cannot replicate or predict the diversity of ever-changing operating conditions in the field. There’s no accurate way to translate results from accelerated weathering testing to actual useful service lives for coatings in the field. The testing should only be used to compare coatings against one another in similar conditions. Resin quality – Resins are key components in coatings because they form the matrices that hold color pigments in place. When testing coatings to judge the quality of their resins, it’s best to use white or light-colored formulas that lack color pigments. That’s because differing color pigments degrade at differing rates, and that could skew the results of tests targeting resins. Color fastness – Not all pigments are created equal—even like-colored pigments. For example, the red pigments used to color a muscle car are of far higher quality than those used in other, shorter-term applications. When testing for color fastness, choose formulations with similar resin quality so that resin degradation doesn’t interfere with pigments. 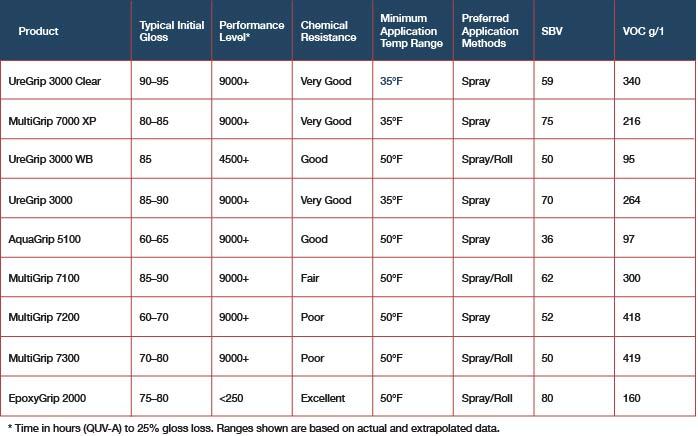 Gloss retention – When comparing the rate at which gloss loss occurs in a coating, it’s critical that the angles to which lamps are set remain constant. Differing angles alter the way light impacts a painted surface, and results will not be reliable. It’s important to maintain other constants in tests, too, like film thickness, application method, curing conditions, testing exposure cycles and testing surface preparation. Ignoring experimental controls allows too many variables to interfere with test results. The Society for Protective Coatings’ (SSPC) standard for two-component weatherable aliphatic polyurethane coatings (SSPC Paint 36) defines three performance levels for weathering finishes. Level 1 finishes are rated based on 500-hour exposures during accelerated weathering tests. Level 2 finishes are rated based on 1,000-hour tests. Level 3 finishes are rated based on 2,000-hour tests. Alkyds or oil-based coatings are typically tested in the 250 – 1,000 hour range; most of these coatings sustain significant gloss loss at the high end of this range. 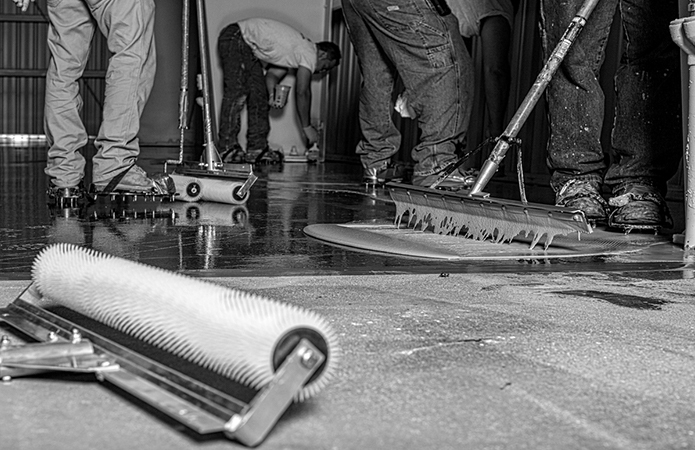 Epoxies lose gloss quickly and begin to chalk after a couple hundred hours of exposure. Acrylic formulations can vary widely, but they typically hold gloss for between 1,000 and 2,000 hours. Polyurethanes are even more variable in formulation than acrylics and are commonly tested for several thousand hours. Polyurethane clear coats care often tested into the 5,000 hour range. Siloxanes and fluorourethanes known as “ultra-weatherables” have shown impressive gloss retention even after 9,000 hours of accelerated weathering testing. The intended use of the asset and whether such a finish is even appropriate. Whether the aesthetic appeal of an asset is important to its end use. Whether a such a finish is being used in conjunction with other coatings or asset protection systems. How frequently you expect to re-coat the asset. We’re here to help you answer any questions you may have. If you want to talk through your options further, let’s talk. You can also explore our products in greater detail by downloading our product data sheets here. Choosing the right weathering finish is just one step in assuring your next painting project goes off smoothly. In this guide, we take you through all the elements of a productive —and painless— industrial painting program. US Coatings is enhancing customers’ ability to comply with hazardous material storage and containment requirements by offering prefabricated hazardous material storage buildings. Industrial firms rely on these structures to safely store dangerous corrosive, flammable, combustible or other hazardous materials that they must keep in or near their facilities. Non-combustible steel construction – Designed to store flammable or combustible liquids and other hazardous materials, these structures feature exterior weatherproof unitized non-combustible steel construction made with welded structural and heavy-gauge steel sheets. Two-hour fire-rated uni-directional – These structures are designed to store flammable, combustible, corrosive and poisonous materials and incorporate weatherproof two-hour fire-rated non-combustible heavy-gauge steel construction. The design includes layers of UL-Classified fire-resistant gypsum wallboard between the exterior steel and interior galvannealed steel sheets. Two-hour fire-rated bi-directional – This model safely contains drums, compressed gas cylinders, bottles and other hazardous material containers. It features weatherproof bi-directional two-hour fire-rated non-combustible heavy-gauge steel construction and includes layers of fire-resistant gypsum wallboard, insulation and galvannealed interior and exterior steel sheets. The structure meets UL Fire Resistance Rating U425. Four-hour fire-rated bi-directional – This structure is designed to contain drums, totes, compressed gas cylinders, bottles or other hazardous material containers when they must be stored very close to other buildings or within a larger structure. It meets UL Fire Resistance Rating U490 and features bi-directional four-hour fire-rated non-combustible heavy-gauge steel construction with insulation and two layers of UL-Classified Ultracode fire-resistant gypsum wallboard. Exterior surfaces are made of corrosion-resistant galvannealed steel sheets. Screened air inlet vents with UL-Classified three-hour fire-rated dampers. Open channel building base to allow for under-building inspections and for forklift and crane sling transit. Internal spill containment capacity of 30 percent of the total storage capacity. Hold-down brackets to bolt structures to foundations to resist seismic and wind loads. Static ground system including an exterior grounding connection, grounding rod, copper conductor and grounding lugs. All buildings are Factory Mutual-approved and labeled and meet all state and municipal building code requirements. We know one size doesn’t fit all. That’s why we offer customization options for customers whose unique hazardous material storage needs require individual solutions. Using modular construction, we build units up to ten feet tall and offer widths of 6 – 14 feet in two-foot increments. We can also vary the lengths of your structure, starting at 8 feet long and topping out at 52 feet, also in two-foot increments. Optional temperature control systems and explosion relief vents that comply with NFPA 68 are also available on all US Coatings prefabricated hazardous material storage buildings. If you’re facing a hazardous material storage requirement, we want to guide you to the solution that best fits your need. Let’s talk — together, we’ll identify the building and accessories that ensure your hazardous materials are kept secure and your personnel and assets are protected. Compared to other equipment and capabilities necessary in productive warehouses or other industrial settings, the paint chosen to coat a concrete floor never tops anyone’s list. But warehouse floor coatings are critical to safe, efficient operations because they can reduce slip and trip hazards, protect concrete from harmful spills and heavy abuse and increase an operation’s efficiency. At best, underestimating the necessity of the right warehouse floor coating can hold an operation back from running at peak efficiency. At worst, it puts employees and assets at risk and firms on the hook. In settings where heavy shelves and forklifts are used, the right warehouse floor coating can protect concrete from cracking and chipping as well as the harmful effects of spilled chemicals. Coatings also protect people. Workers can move more safely on floor coatings engineered to resist slips and trips. Spilled chemicals can be located and cleaned more easily when they contrast with the color of a floor coating. Differing floor coating colors can also separate sectors of a warehouse. This increases efficiency and reduces the risk of confusion and accidents. Utility bills in warehouses add up. But the right warehouse floor coating can reflect light, keeping spaces more brightly lit. High-gloss coatings can reduce the cost to light a space or lead to the reduction in amount of lights used. Aesthetics do matter. While a floor’s coating can add value in terms of safety, efficiency and asset protection, they’re also more pleasing to look at. Certain colors can even improve workers’ moods. MMA – Low-glare Methyl Methacrylate (MMA) systems are resistant to some acids, alkalis and solvents and boast a fast cure time—you can walk on an MMA-coated surface in less than two hours. MMA can be applied at lower temperatures, can withstand elevated temperatures and has a much higher dry film thickness (DFT) than other systems, making it resistant to scratching. But floor preparation cannot be overlooked as MMA systems don’t bond as well to substrates compared to other options. Good ventilation is required when applying odorous MMA coats. MMA systems require as many as four coats and are costlier compared to other systems. Epoxy and urethane – These systems also resist chemicals well and boast high hardness. Their dry film thickness is on par with other coatings systems, require three coats and are among the less costly alternatives. But these systems do not cure quickly. The walk-on time of 24 hours is among the longest of the available systems; because each coat takes longer to cure, the total project time takes nearly two days. 100% solids epoxy – These systems stand up to abrasion and chemical spills and can be applied to floors as part of a multi-part system or on their own. Because these coatings are 100% solids, their wet film thickness and dry film thickness are identical. That means no thickness is lost due to evaporation of harmful volatile organic compounds (VOCs). For this reason, 100% solids epoxy coatings are safer to use. They’re also the cheapest option, but they do not cure quickly —walk-on time is up to 24 hours. Polyaspartic – This hybrid system is an offshoot of epoxy and urethane systems that offers the advantages in a single coating what two coatings of epoxy and urethane systems can muster. Polyaspartic formulations can be manipulated to allow for curing times that suit individual projects and can be applied at temperatures well below freezing. Walk-on time is just four hours and polyaspartics are safer to use due to only moderate odors. These systems are costlier than epoxy / urethane and 100% solids systems but offer better flexibility compared to the other options. No industrial setting is identical, so one coating type certainly doesn’t fit all settings. That’s why US Coatings offers a range of floor coating options made to suit your individual needs. GripCrete 200 SL – This 100% solids flooring epoxy is recommended in interior spaces where abrasion resistance or chemical protection is desired, including warehouses, service centers and commercial buildings. It can be used alone or in a multi-coat system. GripCrete 200 SL can be applied directly to concrete but the risk outgassing / pinholing is reduced if the surface is primed. See additional GripCrete 200 SL specs here. GripCrete 1750 MVE – MVE stands for moisture vapor emission. This low-odor, low-VOC, 100% solids concrete primer / sealer minimizes outgassing and moisture vapor transmission. GripCrete 1750 MVE is suitable for use as a primer in confined spaces and in underground or above-ground concrete coating applications. It can be applied to damp concrete. GripCrete 1750 MVE is prone to chalking and ambering under sunlight in humid conditions; urethane or polyaspartic topcoats (such as GripCrete 200 SL or GripCrete 9000 PA) are recommended to prevent epoxy erosion and to retain color. GripCrete 9000 PA – PA stands for polyaspartic. This next-generation coating is designed for a wide range of interior and exterior applications, including in warehouses, factories, chemical processing plants, stadiums and institutional buildings like hospitals and schools. It can also serve as a topcoat over other US Coatings floor systems. GripCrete 9000 PA is fast curing and UV-stable. Polyaspartic coatings add greater value because they achieve in a single application the benefits of an epoxy and urethane system. As project timelines and budgets constrict, a polyaspartic warehouse floor coating could be the option that returns industrial spaces to service faster while keeping workers safe. Thinking strategically about your warehouse floor coating can raise many questions, so contact us and we’ll help guide you through choosing the coating that best suits your space and developing a coatings maintenance plan. To get additional information about the products we offer, consult our product catalog. Choosing the right coating for your industrial assets is important. The right choice could mean added useful life and less maintenance for key assets. The wrong one might lay the groundwork for untimely and costly failures. Foreknowledge of which coatings are better suited for different environments and job specifications is key to an efficient and effective coating job. Let’s compare epoxy and urethane coating systems, a longtime staple of industrial asset protection, to polyaspartic technology, a hybrid coating type increasing in popularity because it can limit lag time and reduce costs. Epoxy and urethane coating systems offer two layers of protection over a surface. These perform well in heavy industry settings because they’re more tightly cross-linked and less permeable, offering good substrate protection, increased chemical resistance and greater hardness. Due to these qualities, metal and concrete substrates protected by epoxy and urethane combinations stand up well to use and abuse. Epoxy and urethane coatings also can tolerate exposure to many industrial chemicals. For instance, surfaces protected by epoxy and urethane coatings stand up well against sulfuric acid, which is used in a wide variety of industrial processes. However, certain organic acids present in food production, such as nitric acid, can harm epoxy and urethane coatings. Epoxy and urethane coatings are well-suited for interior spaces with controlled environments. Relatively new on the industrial coatings scene is polyaspartic technology, a hybrid coating similar to polyurethanes. Innovations in the technology have made these coatings a more versatile option compared to epoxy and urethane coating systems. Applying polyaspartics in a single coat accomplishes what traditional epoxy and urethane systems need two coats to do. The technology has come a long way as early polyaspartic formulations had low adhesion values. Well-known system failures have been blamed on this lack of adhesion promoters in early polyaspartic technology. Polyurethanes are softer, more flexible and offer better color and gloss retention. They perform well as structural protection, are more versatile in terms of protecting assets in harsh weather conditions and offer better impact resistance than epoxy and urethane coatings. For example, tanks, exterior pipes, barges or exterior concrete are better protected with polyurethane coatings. Polyaspartic technology breaks from traditional polyurethanes because polyaspartic esters can be manipulated to suit varying applications. Manipulating the esters allows for controlled drying times and extends potlife. Where epoxy and urethane coatings require much longer curing times, polyaspartic coatings cure much more quickly. That limits lag time, allowing assets to be put back to use more quickly. Polyaspartic coatings also can be formulated for application and curing at temperatures well below freezing. Polyaspartic technology eliminates a step in the coating process compared to epoxy and urethane combinations, saving labor and material costs and shortening project timelines. Because lower- and zero-VOC coatings can be achieved with polyaspartic technology, it’s safer to apply in confined spaces like storage tanks, railcars or pipes where ventilation is minimal. This also can save on taxes levied against high VOC outputs. US Coatings’ newest polyurethane coating presents a solution in the polyaspartic vs. epoxy and urethane debate. Formulated to protect metal substrates, UreGrip 3360 incorporates polyaspartic technology with advantages that include direct-to-metal application, excellent color and gloss retention and single-coat high build capability. UreGrip 3360 boasts outstanding durability and weathering characteristics and is used to protect a wide range of industrial assets. UreGrip 3360 offers a two-hour potlife. Faster curing means assets can return to service on the same day as application. Reduced downtime cuts costs; these savings are multiplied when UreGrip 3360 is used in subsequent surface coating programs. As the industrial coating landscape changes, US Coatings is ready to help owners and managers determine the best coating solutions to their specific needs. Contact us for a consultation or view our product portals to learn more about what we offer.